There is definitely something nice about a big, spacious bathroom with plenty of room to move around, and which doesn’t leave you feeling cramped when you’re in the shower or using the toilet, but it’s a mistake to think that the square footage alone is what leads to an un-cramped, functional space. If not designed properly, a 500-foot bathroom can feel more constricting and limited than a well-designed commode half that size. 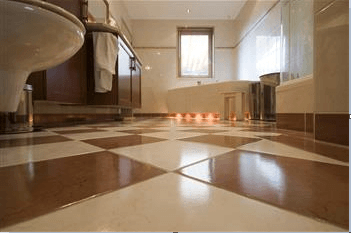 Believing that bigger is the only way to achieve comfort and functionality can often lead to a bathroom remodeling project eating up valuable home floor space that would be better used as something else. If you’re not sure how to fit everything you want in a bathroom into the space you have, consult with an interior designer or professional remodeler; they can most likely help you plan a layout that makes more space out of less room. When planning a remodeling project, you should always expect it to go over budget. Unexpected issues such as mold, dry rot, antiquated plumbing, electrical problems, etc. can come up during even the smallest remodeling project, and can easily eat up an entire renovation budget before even the major repairs are complete. Planning to go over budget (and making sure you have the money available to go over budget) is the only way to be absolutely sure that your bathroom remodel will be completed and that you won’t spend a month using the gas station bathroom while you wait to be able to pay for repairs in your home to be done. Going DIY with your remodeling project can seem like a good way to save money on expensive contractors and repairmen, but unless you really, really know what you’re doing, trying to install plumbing and electrical wiring by yourself is usually just a good way to end up damaging your home, causing yourself or a family member injury, or costing yourself even more money than you would have spent hiring a contractor in the first place. There’s a reason plumbers, electricians, and other contractors go through training and certification – it takes skill and knowledge to properly remodel a home and install plumbing and electrical systems. Unless you have those skills and knowledge yourself, it’s best to trust the task to the people who do. Have you ever spent a long time in a bathroom with poor air circulation? If you have, you know it gets miserable pretty quickly. If you’re planning on relocating your home bathroom or adding an additional one, it should always be sited on an outside wall with a window that can be opened to let in fresh air and sunlight. If that’s not possible, adding a skylight to the roof will achieve the same results. There’s a reason most bathrooms aren’t visible from the living room, dining room, or sleeping area: Most people don’t want to be looking at a toilet when they’re eating dinner or watching TV. A home bathroom should be located in a place that creates privacy for the people using it, and where it is separated from the other rooms in the house. Once you’re ready to get started remodeling your bathroom, remember that American Bath Enterprises has a full selection of shower stalls, window kits, and ADA-compliant baths. To learn more, contact us today at 888-228-4925.